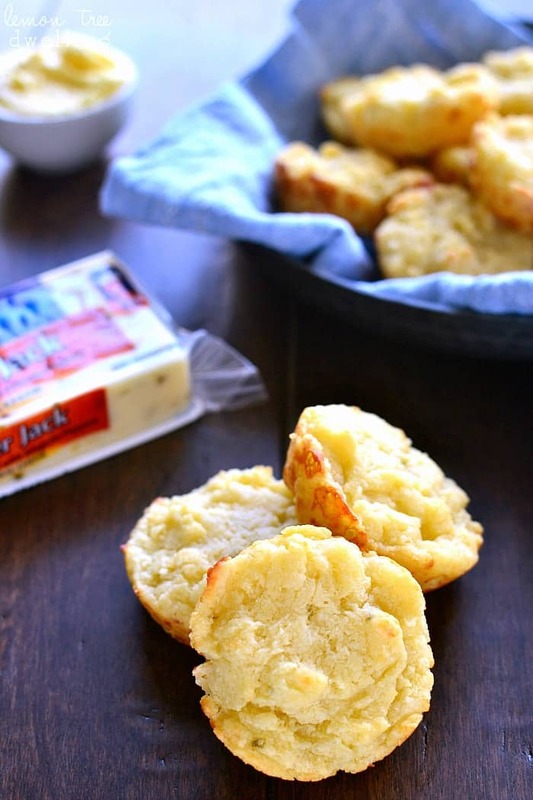 Easy Cheesy Muffin Tin Biscuits are rich, buttery, and loaded with the delicious flavor of pepper jack cheese. They come together in 5 minutes or less and make the perfect addition to your holiday table! I saw something on Facebook the other day that made me chuckle. It was something along the lines of Thanksgiving being that special day each year when we make 17 side dishes our kids won’t eat. I don’t know about you, but around here, that couldn’t be more true! This Thanksgiving we had not one, not two, but THREE full turkey dinners. And each one of them seemed to be just another opportunity for my kids to turn their noses up at all the delicious options. Stuffing? Nope. Sweet potatoes? No way. Green bean casserole? You’ve got to be kidding me. In other words, their plates consisted of a little bit of turkey, mashed potatoes and gravy, and cranberry sauce….straight from the can. Now. I know that the holidays are about so much more than food. But honestly? Food is such an important part! It made me realize that I need to up my game for Christmas! 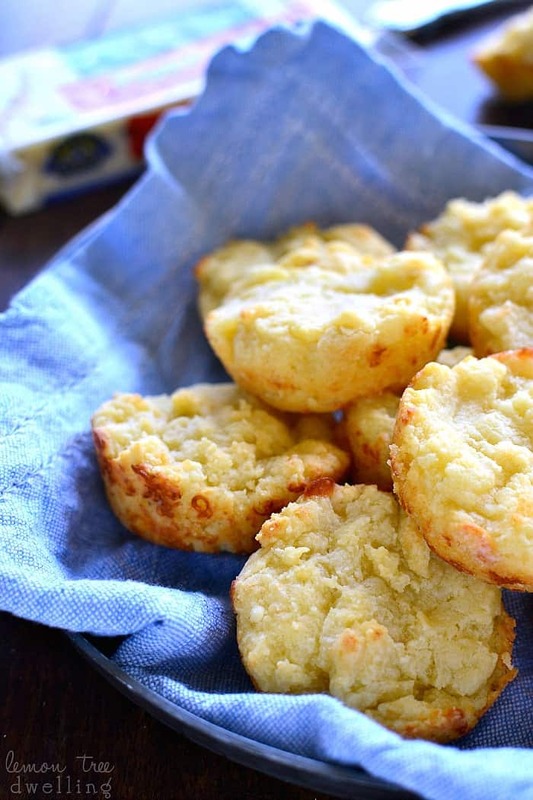 Enter: these Easy Cheesy Muffin Tin Biscuits. They’re rich and buttery and loaded with cheese, and absolutely perfect for adults and kids, alike. Of course, when cheese is the main ingredient, it’s important to be choosy. My go-to is always Crystal Farms® Cheese. It doesn’t hurt that it’s a Wisconsin brand, made right here in Lake Mills. But more than that, Crystal Farms® has been a trusted brand since 1926. Today, it’s one of the largest cheese brands in the country, offering a variety of cheese products that are rich in calcium and made with few preservatives. I love the great selection I’m sure to find in the refrigerated dairy section of my favorite grocery store. 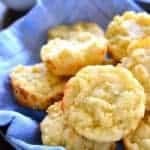 For these biscuits I used Crystal Farms® Pepper Jack for a little kick, but you could feel free to substitute your favorite flavor. 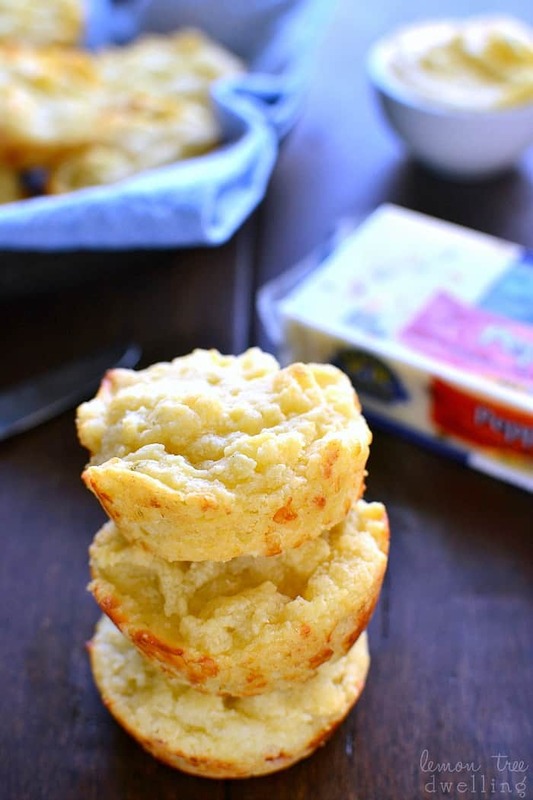 What I love about these Easy Cheesy Muffin Tin Biscuits is that they’re absolutely fool-proof and they couldn’t be easier to make. Just melt, mix, pour, and bake….and they come out perfect EVERY time! What else I love about them? The fact that my kids love them as much as I do! Which makes for not-so-sad looking holiday plates…..and happier moms everywhere. To find out more about Crystal Farms® products, visit them on Facebook, Twitter, or Pinterest! Remove from heat; stir in cheese. Let stand 2-3 minutes. Add sour cream, flour, baking powder, and salt and stir until combined. Drop into 24 lightly greased muffin cups. And…..to help you with your holiday hosting, I’m giving a 14” Oval Le Creuset Stoneware Dish away to one lucky winner! (Please note – the dish will come in blue.) Enter to win below. Good luck! 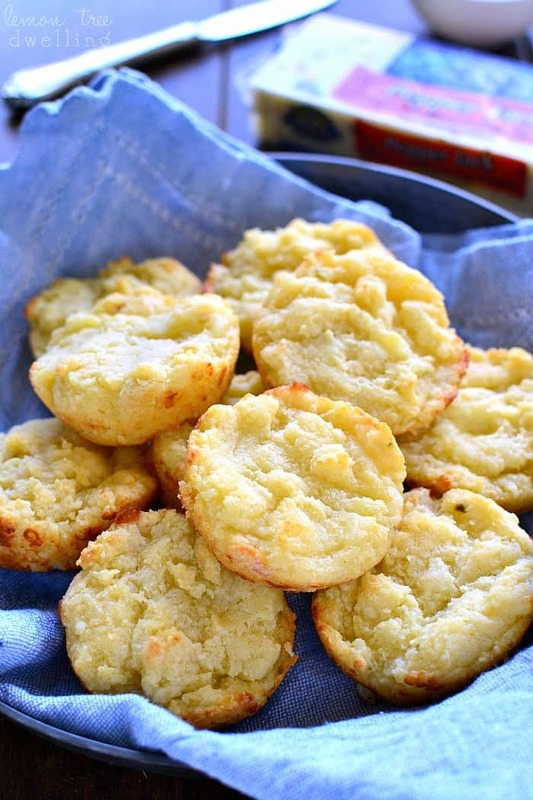 If you are loving these biscuits be sure to try my Garlic Dill Shamrock Biscuits as well! I would make a cheesy potato dish! Bread sounds like a great thing to make in a casserole dish! I love how simple this recipe is. Pinned! Accordingly, here’s a view of The Heartbreak Kid as a Jewish Tragedy, a warning to all assimilationist American Jews: No wonder Phil’s parents liked it. One may love or hate the movie, depending on how one feels about the Grodin character. All the other characters are obvious stereotypes. You could just read Philip Roth. Another movie like that is The Apprenticeship of Duddy Krawitz, a tad more contemporary movie not reeking of Israel Zangiwill (sic?) melting pot. I think this is among the most vital info for me. And iÃ¢â‚¬â„¢m satisfied studying your write-up. Nevertheless ought to commentary on couple of normal issues, The internet site taste is ideal, the articles is in reality exceptional . Superb activity, cheers. These biscuits would be gone in a flash here! yum! Easy cheesy is my jam! 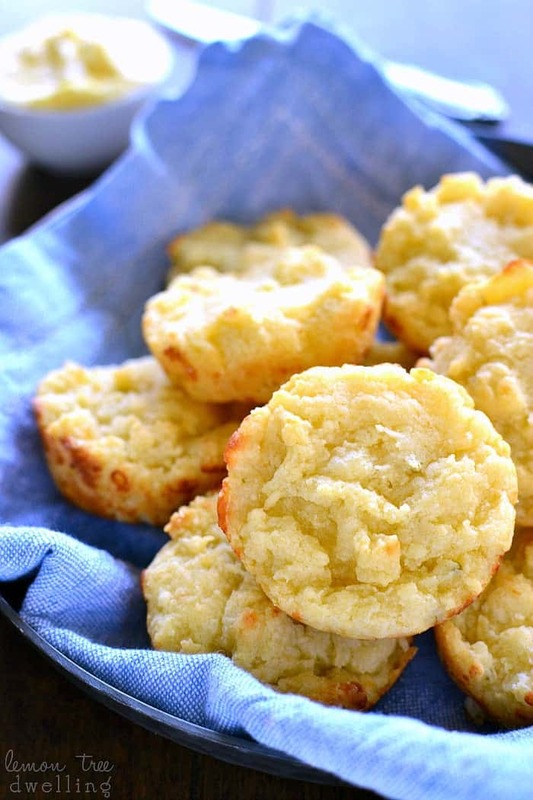 I could eat a dozen of these biscuits! Oh yes, please, I could eat all these myself. I would make a comforting gratin! I love making biscuits in a muffin tin! Mainly because they’re perfect for slicing open to add butter haha. Love these! I would make a yummy,homemade mac n cheese, with bacon and sweet onions. Thanks so much for this chance! LOVE these! 6 ingredients? Sold! Something hearty. Maybe a pot pie? Or mac & cheese with a bajillion kinds of cheese? I would make a big batch of scalloped potatoes, thank you for this chance. Happy Holidays! What beautiful looking muffins and LOVE that casserole dish!! Taste delicious, seems very simple, but mine did not rise. They are about 3/4 inch tall. Any suggestions? Sorry to hear that, Sharon! They’re not especially “tall” biscuits, they’re a little more dense. You could consider buying fresh baking soda if they really didn’t rise at all though! 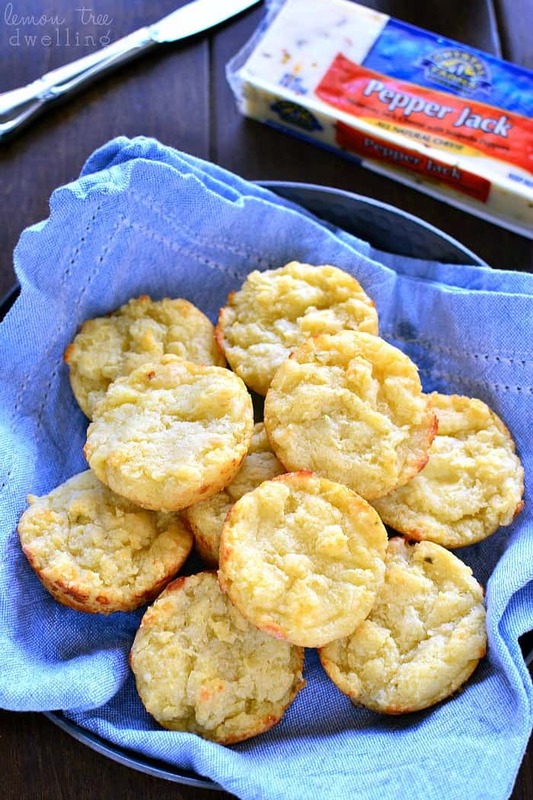 Do you use mini-muffin tins?